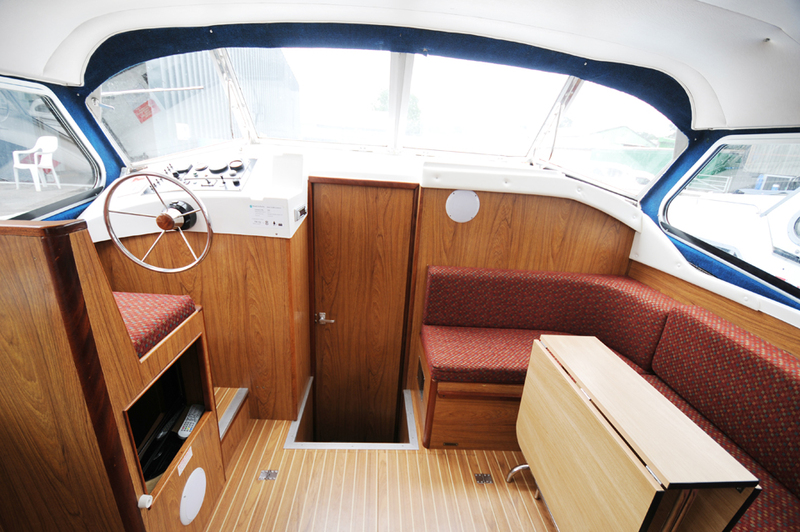 What does a Norfolk Broads hire boat look like inside? 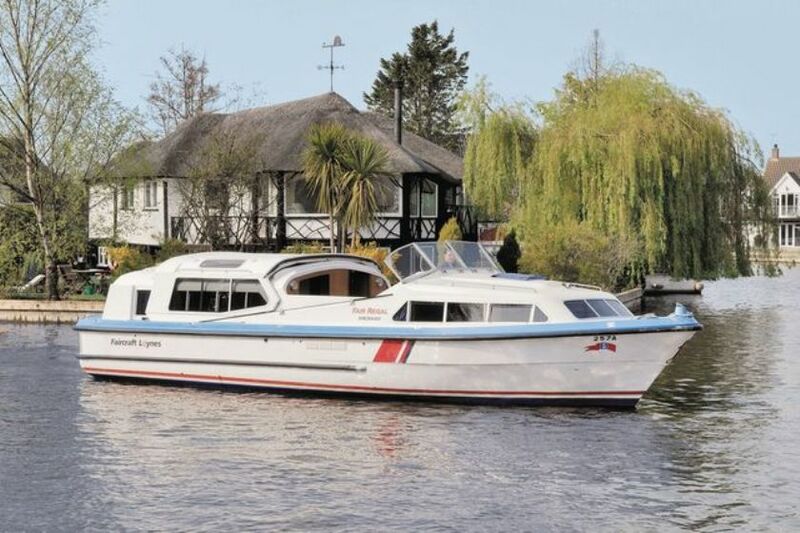 There are around 800 boats available to hire on the Norfolk Broads so it is difficult to be too specific as each will have it's own layout and the standard of fittings will vary. The price range can be considerable and the best way to think of it is that as in all things you get more for the higher priced boats e.g. more modern, perhaps better fittings etc. Having said that all boats will be of a good standard and clean and tidy. In order to give a fair reflection of what you can expect on a hire boat, we have chosen Fair Regal, a six berth cruiser from Faircraft Loynes as a mid range example. Click on the images to view larger sizes. 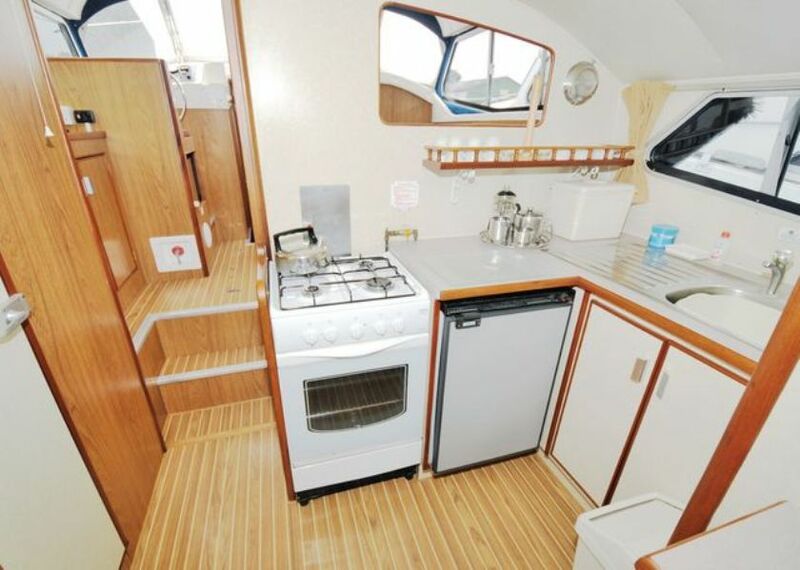 Fair Regal is a 6 berth cruiser driven from the centre cockpit (other examples here). This type of boat usually incorporates a raised seating area below a sliding canopy which can be open or closed depending on the weather. The big advantage with this set up is the option to dine al-fresco and be at a height which affords views above the reed fringed rivers of the Norfolk Broads. Other boat types include forward drive cruisers, dual steer cruisers and boats with an aft cockpit,. (examples here) are good for first timers or small parties as steering from the front enables you to guide your boat through bridges and tight spots much like driving a car. It is also easier to exit the boat from the front when mooring which helps when there are only 2 or 3 of you onboard. Their disadvantage is that because the floor is on one level you do not get as a good a view over the reeds to the countryside beyond. (examples here) allow you to pilot the boat from outside usually on the deck top, or from inside in the saloon area. This way you have the best of both worlds. You have excellent views from the outside with the option of steering from below should the weather be inclement. These craft tend to be the latest designs and are usually at the higher end of the hire charge spectrum. (examples here) are also preferred by many first timers and those who like fishing due to the large outside space in the cockpit. The view is usually good from the raised steering area and access to the bank is good, especially so when stern on mooring is necessary. The tend to be for smaller parties only - rarely having more than 4 berths. This is Fair Regal's saloon, sometimes referred to as a stateroom or lounge area. Within this space is enough seating appropriate to the party size together with a fold away dining table. The deck is made of holly and teak though on many boats carpeting or laminate flooring is preferred. A colour television and cd/radio (the type you find in a car) would be sited here together with cupboard storage space. 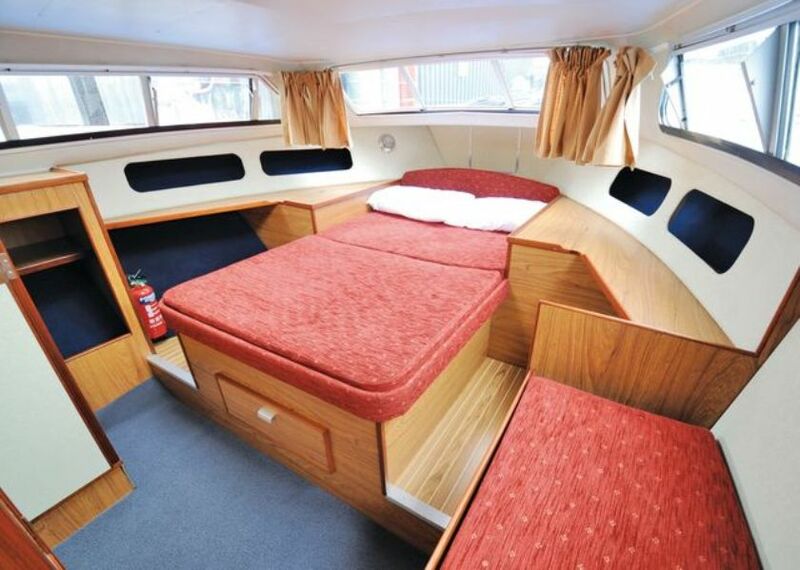 On this boat the seating area converts to a double bed. This can be a consideration because not everyone wants to make up a bed each evening after waiting for other party members to retire. 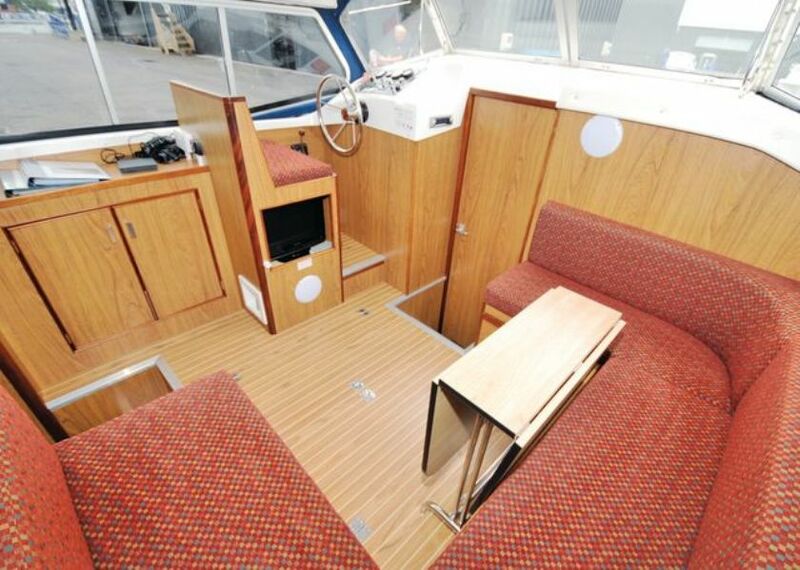 However, this set-up is cheaper to hire than a boat with dedicated made up berths. The view of the kitchen area illustrates how the next room, the saloon, is raised for better viewing. The kitchen itself will include a cooker and hotplates - usually gas powered, a refridgerator and a sink with hot and cold running water. Some boats also have a microwave. You will not need to bring any pots, pans, plates, dishes, cutlery or cooking utensils as all are provided on the boat. You will even have a salt and pepper pot - though you will have to bring the contents yourself. Some boat fridges are not the size you would find at home. As such it is wise to view it's size then shop accordingly rather than bring too much with you then find you don't have enough space in the fridge to keep it cool. Fair Regal's fore (front) cabin has an island bed, which means you can get in on either side. Such are the limitations of space on a boat, often berths are set against one side of the cruiser. This means access is from one side only. For double berths this can be bothersome because you or your partner will have to crawl over one another to get in or out, perhaps in the dark of the night. The cabin will have a wardrobe with hanging space though rarely is this full height. There will also be cupboards and drawers for clothes storage. Sheets, pillows and duvets are all provided. However, if you are fussy about the softness of the bed as I am, you might want to bring your own winter duvet to put on top of the mattress for added "padding". The deck plan gives an overall view of what facilities can be found on Fair Regal. You will see that cabins are generally walled off with access through a door. This boat has two toilet compartments incorporating showers. Access to the shore is through the doors at the back (aft) of the boat. Bear in mind this involves moving around the side decks when coming in to moor. Do not choose a centre cockpit boat if you have walking difficulties - go for a forward drive which offers access from both ends of the boat. Use our boat search to find your ideal holiday home. It lists every boat for hire with HOSEASONS BOATS and BLAKES BOATING HOLIDAYS together with other smaller independent boatyards.